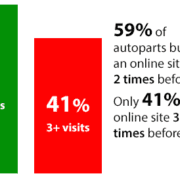 This AdWords research covers consumers searching online for auto parts that modify a vehicle’s performance. Online queries for performance modifying search terms grew 20% in the third quarter 2015 over the previous year, according to search metrics released by Google (scroll to the bottom to download your own copy of the report). One of the notable stats is that mobile searches for performance modifying search terms increased 45%, while desktop queries actually dropped 2%, from the third quarter 2014. This marks at least the fourth consecutive year that online search for performance-type keywords as a whole grew in volume, but does continue the trend of more searches being performed on mobile devices. 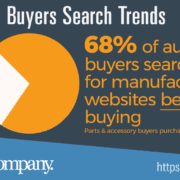 This report covers search queries for parts typically sold by members of SEMA and the Auto Care Association. If you’re in the business of auto parts ecommerce, and your website is not yet mobile-friendly, this should be a wake up call to get that fixed as soon as possible. 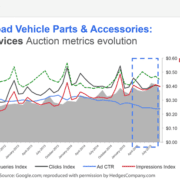 Google search terms vs. impressions: Are performance parts shoppers pickier? This report covers online search terms on Google for parts used for modifying vehicles for enhanced performance, in the United States. Drilling down into Google’s data, overall queries grew 20% while impressions grew 32%. At the same time, the average click through rate (CTR) only grew 2% from last year. This may be due to more options available on the search engine results page (SERP), or an indication that online shoppers are becoming more selective in what they click on. In either case, this underscores the need to constantly test and refine online search ads to maximize performance. Looking more closely at CTR, the average CTR for desktop was up 4.5% while mobile and tablet CTR dropped 3%. 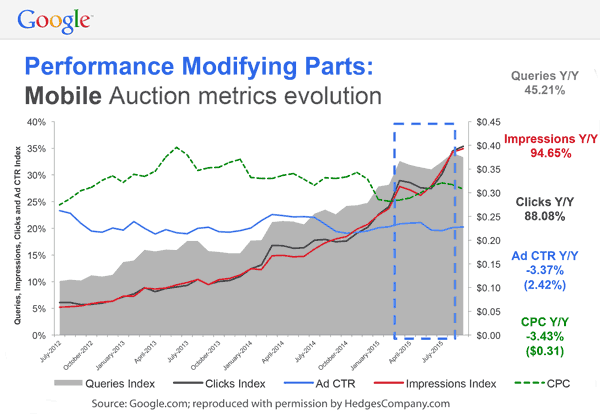 Overall cost per click in the performance modifying parts category was $0.39, with desktop at $0.51. The third quarter saw a drop in Cost Per Click (CPC) of 3% from 2014, driven mostly by mobile and tablet CPC, which dropped 8% from 2014. In the third quarter CPC for mobile advertising was 39% less expensive than desktop advertising, while CPC for tablets was just 2% lower than desktop. Clearly, Google is your best option to reach millions of enthusiasts shopping for performance parts to modify their cars and trucks. With more than 80% of enthusiasts shopping online for information and parts, it’s the single largest performance parts audience…many times larger than the biggest automotive magazines, combined. 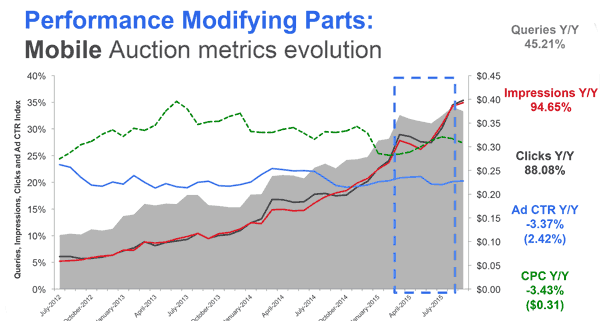 Download your copy of the Google Performance Modifying Parts search trends report, courtesy Google and Hedges & Company, at the link below. The file is an 11 page PDF file and is only about 400KB so it should not take too long to download. Google logo © 2016 Google Inc. All rights reserved. Google, Google Partners and the Google Logo are registered trademarks of Google Inc. Hedges & Company is a Google Partner Agency.